Jonathan Clark started the scale industry ten years ago after finishing his degree in Industrial Mechanics, Technology and Controls. He was hired as a scale technician for one of the largest independent scale companies in South Georgia. Jonathan’s specialties include heavy capacity scales such as railroad, motor truck scale, livestock scales, monorail scales and batch scales. Other specialties include filling systems in chicken plants, pecan and peanut warehouses, lab balances, bench scales, temperature and humidity machines and all mechanical scales. Jonathan has ten years’ experience working with some of the largest scale manufacturers including Toledo, Fairbanks, Rice Lake Weighing, Weigh-Tronix (GSE) and cat bagging systems. Also known as Johnny or John, he has been married for seven years, has a daughter and twin boys. 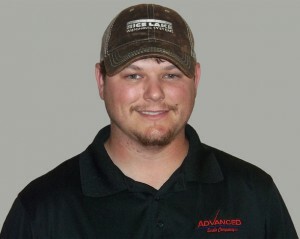 He is an avid hunter and other hobbies include fishing and spending time with his family.